Each capsule of COLD-FX is certified to contain 200 mg of CVT-E002, a proprietary ChemBioPrint (CBP) product containing greater than 80% poly-furanosyl-pyranosyl-saccharides extracted by an aqueous method from Panax quinquefolius (North American ginseng, root). Recommended purpose: Helps reduce the frequency, severity and duration of cold and flu symptoms by boosting the immune system. Recommended use: For adults and children 12 years of age and older. Cautions: Individuals requiring anti-coagulant therapy such as warfarin should avoid the use of COLD-FX. Do not use if pregnant or breastfeeding. Not recommended for individuals with impaired liver or renal function. As COLD-FX is a derivative of North American ginseng, individuals with known allergies to ginseng should avoid use of COLD-FX. Do not exceed the recommended daily dose. I love this product! This is the product I reach for when I feel a cold coming on. It works every time. My husband takes it every day as an immune system booster and it has made a huge difference for him the last few years. 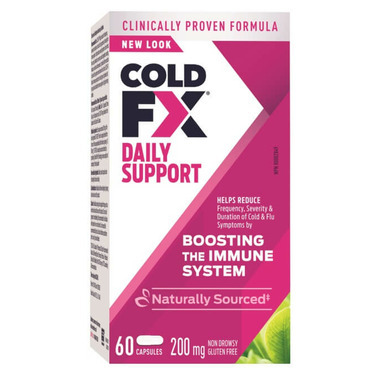 I have used Cold=fX for the last 3 winters and truly appreciate this product as it really restores my health and immune system quickly. I use COLD-FX everyday during the winter months to help keep the cold away and it works! A great product that does what it says it does. We rely on this product...and do not like to be without it. I use Cold FX to prevent or clear up Sinus infections. I find it works much better and faster than anti-biotics - with no side effects!